At work the other day I noticed that our on-site gym was advertising that a company was coming in to perform gait analysis and would give a 10% discount on any custom orthotics. This got me thinking. The method they use to analyse the gait and thus the "need" for orthotics is by using the pressure plate system like the GaitScan system. For those not familiar with this method of analysis; essentially they put a rather advanced pressure mat onto the floor and then have you run over it, barefoot, aiming to land your foot squarely on the mat. You then turn around and come back again and land on the mat with the other foot. You may be asked to perform this a couple of times. 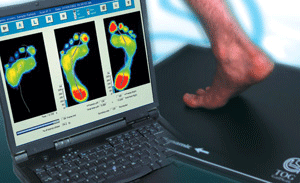 Once done, a fancy colourful series of images is then presented onto the computer screen from which the agent can then analyse your gait. If you've never seen or experienced this system in action, pop down to your local Sweatshop, they'll be more than pleased to put it into action (and then sell you a pair of shoes 😉 ). It only analyses one foot at a time. Now whilst not a major issue, the fact that the foot plate is only big enough for one foot would mean people are more likely to adjust their stride and landing in order to ensure they land squarely on the mat. What's more, people are likely to strike the ground with the foot landing on the mat harder than normal to ensure they really do hit it and they get a reading. The test is always done indoors and in a relatively confined amount of space. I can't comment on other people, but 10 - 20m of total distance is not enough for me to get into my full normal stride - the stride I'm likely to be employing when I actually head out onto the road. And most importantly, you always perform the test barefoot. It's essential the test is done barefoot so the computer can see how your foot is landing (assuming we ignore the above) and reacting and pushing off. Now the problem with this comes in the fact that scientists have already proven that people run differently when wearing shoes, then when not. A heel striker in shoes is not likely to be a heel striker barefoot. The foot will also land more carefully when barefoot and the push-off won't be as hard. I'm not a doctor, and I admit I have experienced this method of gait analysis and bought a pair of shoes based off it's results in the past, but in retrospect I can't help feel it may be completely unnecessary (thankfully you don't have to pay for the analysis) and could potentially lead to more injuries as the analysis, in my eyes, is flawed. So what's the alternative? Well, barefoot or nearly barefoot running as nature intended all the time of course, but that's a very biased view. If you really need to have gait analysis performed (I doubt you do unless you're a pro trying to eke out every bit of efficiency possible), then I believe the video method, on a treadmill, is a better system to use, though it too has it disadvantages, namely access and costs, and is likely to have it's own flaws too (I've not been privileged enough to have one of these so I can't comment). With what I know now about the benefits of running barefoot and the way the foot adjusts and strengthens to the new demands, I think people should toss the shoes for at least one session a week for a couple of months and then see if they really still need to get orthotics.